If you are planning on getting married or expanding your family in 2018, you also need to review your estate planning needs and make appropriate changes. After your wedding, you should revise your will and ensure that your spouse is included in your division of assets. Your spouse will have opportunity under Florida law to take a share from your estate if you do not make provisions for him in your will or try to disinherit him. If a person gets married after writing a will, and does not change the will to make provisions for the new spouse, the law considers the new spouse a pretermitted spouse. A pretermitted spouse inherits from a spouse’s estate as if the deceased spouse died intestate, that is, without a will. If the couple has no children, the spouse can inherit the entire estate. If the couple wants to ensure that the law on pretermitted spouses does not apply when it comes to their estates, they can do so using prenuptial agreements. If your family is expanding, either through the birth or adoption of a child, or the blending of two families, you should review your estate plan to ensure that the children will be taken care of if you pass away. Remember that minors cannot inherit assets directly under Florida law. This means that if you leave assets to your children directly in a will, the court would have to appoint an adult to manage the inheritance on behalf of the children. The better way to leave money to minors is through the use of trusts. Which trusts works best for your children depend on their particular needs. For instance, the type of trust you set up for a minor child with special needs will be different from one you set up for a child who is about to turn eighteen at the time you create the trust. While you are considering passing on property to your children, you should also consider naming a legal guardian for your children. This is a person you trust, and who would be willing to take care of your children after your death. Selecting a legal guardian is a major decision that should not be taken lightly. Your choice of a legal guardian would still have to be approved by a court. You should also review and update your beneficiary designations on your insurance policies, and update the people you have designated as having your power of attorney in case of incapacitation. There are other details in every estate plan that need to be updated when you undergo major life changes. 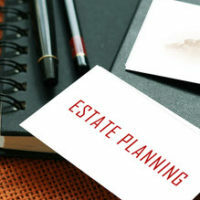 For an individualized look at your will, trusts and other aspects of your estate plan, contact an experienced estate planning attorney from the Millhorn Elder Law Planning Group located in The Villages, Florida for a consultation.